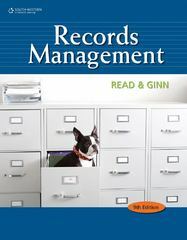 Records Management 9 Edition RECORDS MANAGEMENT, 9e is a comprehensive introduction to the complex field of records management. Alphabetic filing rules are included, along with methods of storing and retrieving alphabetic, subject, numeric, and geographic records. Thorough coverage is provided for filing and maintenance of paper, automated, micro image, and electronic imaging records. For additional Student and Instructor Resources, visit the product companion site at www.cengage.com/officetech/read.